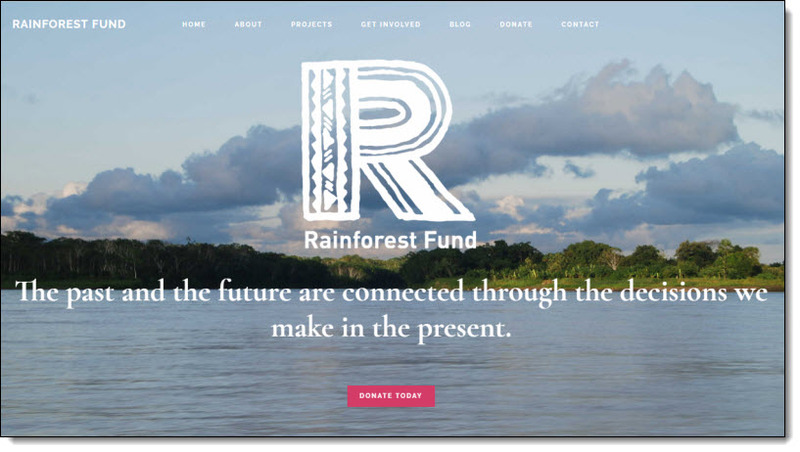 Rainforest Fund came to Tadpole Collective for help sprucing up their old website on a limited budget. We gave them a fresh, new look with a WordPress Launch Pad. Tadpole customized a pre-selected, mobile-friendly Theme to incorporate Rainforest Fund’s logo and color scheme — we work with all our Launch Pad customers to select a Theme that will work best for their content presentation requirements — and configured plugins to allow them to create custom contact forms, optimize their pages for better search engine visibility, and incorporate their social networking icons and mailing list sign-up form. The Tadpole Collective was extremely helpful in the website design, launch, and maintenance process. We were having difficulties with our previous website, and Tadpole evaluated the site, made professional suggestions, migrated all of our current data, and organized everything to a WordPress theme we had selected. In addition to helping with the migration, they addressed all of the concerns we had about our previous website such as website security and engagement, while bringing in their expert suggestions to make the website more efficient and user-friendly. Tadpole was always available to answer any questions and concerns we had, and would quickly follow up with research on topics we were not able to cover on regular conference calls. They not only assisted in the set-up and transition to the WordPress platform, but they also taught us how to utilize and maintain the new website features, including an overview of how to review the new SEO data which will improve user engagement and strategies. With their wonderful support and reasonable cost for a non-profit’s budget, we would recommend the Tadpole Collective for website design and support.